There was always something a bit odd about the proposed friendly between Newport County and Aston Villa. Villa had announced their preseason fixtures against lower league opposition shortly after the end of last season, A month later, a fixture against Newport County was inserted into the schedule, with the date of the match coming two days after the final game of a three-in-six days game run for Villa against lower league teams. Preseason is about fitness, but four games in eight days is pushing it a little, isn’t it? Still Villa supporters – especially those who reside in Wales – weren’t going to complain. Newport gleefully announced the tickets details. 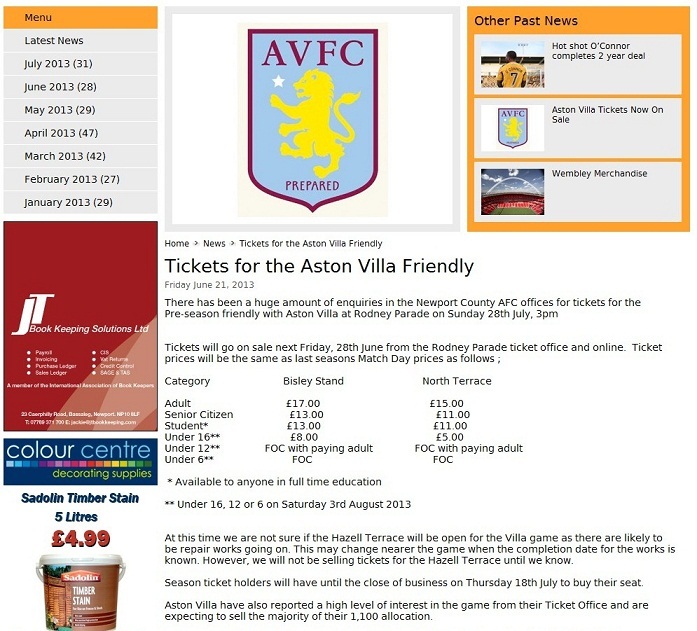 According to them, ‘Aston Villa have also reported a high level of interest in the game from their Ticket Office’. Apparently, Villa were expected to sell the majority of their ‘1,100 away allocation’. Hot ticket? A mouth-watering match against the Villa for Newport fans. Around a 1000 Villa fans are coming, so it must be good. Interestingly, when Aston Villa first announced the ticket details to their supporters on their website a mere three days later, the allocation was less than half of what was stated on the Newport website. It appeared, to get one of the now shrunken ticket allocation of 500 wasn’t going to be easy either; the detailed list of qualification criteria didn’t even stretch down to general sale. At this point, it’s also worth mentioning the price set by Newport County for this match. £17 for an adult ticket. On their own website above, they state ‘Ticket prices will be the same as last season’s Match Day prices’, as if it was some kind of inflation beating deal. The day before the game at Rodney Parade, I watched an interview with the Newport chairman saying he was hoping that Villa would play several first team players. That’s when the alarm bells rang. Lambert had been traveling to all friendlies with a first team squad – why would the Newport chairman even mention such a concern? It was only upon seeing the Villa team line-up and it’s ‘Under-21 team’ label on the club’s official Facebook page on game day, that MOMS finally realised the friendly wasn’t all it seemed. How come ourselves and many other fans on both sides were surprised by this team line-up? While we had our suspicions that this wouldn’t be a strong Villa team, we were genuinely surprised by the fact it was suddenly labeled an ‘Under-21’ outing. To the supporters who had bought a ticket – this was not the match they had paid for. Who in their right mind would pay £17 to see Newport County against Aston Villa Under-21’s? Newport County in setting the price at £17 and dangling the prospect of the likes of Christian Benteke playing (see video below), plus, hyping up the amount of Villa fans coming, to give the fixture apparent legitimacy, were definitely guilty of misleading their fans. Charging an over-the-odds ticket price for a friendly game exaggerated the situation. If the game was less than a tenner, then it wouldn’t be such a big deal, as there can be no guarantees in friendly line-ups. This price was giving the game expectation of being an ‘event’. It was no surprise to see the Daily Mail (and other press) pick on the disgruntlement of Newport supporters at the Villa line-up with their headline of ‘Who? Fans fork out £17 to see unknown Villa reserve side despite top flight club ‘confirming’ they would play stars’. If Villa made such a promise, then it’s not good form reneging on it. But, it seems that Newport’s approach to the whole fixture was based on the hope of Villa playing first team players. Looking at Villa’s cluster of fixtures in the week leading up to the game, especially with the fact Villa had played a game less than 48 hours before the fixture, only confirms this. Yet, Villa didn’t object to Newport’s marketing of the game as a standard pre-season friendly and seemed to play along. It’s been noted that the Newport County friendly didn’t appear in the fixtures on the club’s website, but this is hardly any mitigation when the club on every ticket office update, were selling the Newport game as a normal friendly fixture right up to announcing the Villa team line-up. Villa ticket office update on the 25/07/13, the Thursday leading up to the weekend fixture. If the Villa marketing team were as sure as they seem in hindsight that this was a ‘Development squad fixture’, why didn’t they make that clear on their website, when selling £17 tickets? And why not be upfront with Newport over the team that was traveling to Wales? It would have avoided them being accused of ripping off Newport fans in the press, when in actual fact, it was Newport that were clearly to blame for leading their own supporters on. It’s not that hard to advertise a game for what it really is. This month, non-league Lincoln City had arranged pre-season friendlies against Sunderland and Middlesborough, but in the honest spirit of full disclosure, both games had been clearly advertised by the Imps as being against ‘Under-21’ opposition. So why weren’t Newport and Aston Villa capable of doing that too? Greed? That might have had something to do with it. *Both clubs will be sent this article and evidence to have an opportunity to explain to supporters what happened. The Football Supporters Federation have also been notified. It was Macron who were behind the fixture (shirt sponsor to both), hence why Newport were able to attract Villa, despite their busy fixture schedule. It might have influenced the decision not to bill this game as a ‘Newport vs Villa Under-21’ game from the off, like other clubs have done, as it might upset the sponsors who had arranged the game. I don’t know anyone who thought this was a first team fixture. It wasn’t on the pre-season list for the first team. It was on the list for the U21 Development squad though. 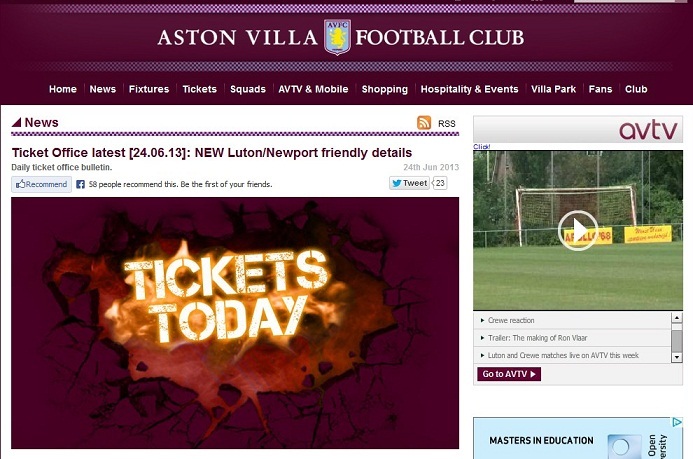 The e-ticketing page is now all in one and can be confusing and that is the only blame that can be laid at AVFC. At the Crewe game I never once heard anyone in the away pub, in the stands or involved with Lions clubs talking about Newport ? No one plays a game less than 48hrs after the last one. Seems like Newport should shoulder the majority of the blame for this and AVFC should have picked up on it sooner. also, lets get one thing straight, a majority of Newport fans commented on how good the game was against our U21’s who gave a brilliant account of themselves, a lot also said it was worth the ticket price. I’ve heard from some Newport staff they were expecting Bent and Ireland to show up. While a good way of giving Newport some ‘star quality’, Villa probably didn’t want to risk injuries…although maybe it would have been better than them gathering dust in the ‘Bomb Squad’? MyOldManSaid you can’t play 40 hrs after playing a game, we used 20 players on Friday night. It takes a full 48 hrs to recover and then train to condition muscles again. Newport surely knew this. @LeeMerrett @MyOldManSaid You’d think so. Interested to know, what this so called ‘confirmation’ was, that Villa names would be played. Your case regarding ‘greed’ seems conclusive. However – amid all the screenshots – one of the Aston Villa FC official websites fixtures page would have been nice. Under the tab marked – Under 21 – you would have found the Newport fixture. Personally – I think the Under 21 should have given you a hint. Villa have a number of teams – and they are all excellent. Newport hosted this event. They set the prices. They set the tone. And now, in the face of criticism, they seek to shift the blame. Pathetic. SonLyme When supporters are on the ticket office & update pages they don’t normally expect Under-21 tickets to be on sale (especially when games aren’t marked as Under-21). Also, the majority of fans have never checked an Under-21 fixture page! I mean, it’s a strange world where you think,’I better check the Under-21 fixtures page, just in case this game is one of there’s’. From a Villa pov the game was clearly not marked as an Under-21 game. Yet, it is of course, their prerogative to play who they want, even it the price was twice that of the previous friendly games. But yes, Newport have definitely set the tone, because reading between the lines, they fully knew that Villa wouldn’t approach this game as they did their previous friendlies (due to having a game already set up less than 48hrs earlier). Yet, they priced and sold it to their fans, as a full on game. And now they play the victim in the press. Overall, regardless of club colours, this is more about how supporters are abused more than the average consumer. In basic consumer law, if this was a supermarket transaction, most people would be queuing up at the customer service desk, the next day, asking for a refund. MyOldManSaid SonLyme I agree. Fans being mis-sold here. But important to state this has nothing to do with Aston Villa FC. Newport arranged this match – it was their gate – and their rules. £17 is a disgrace no matter who is playing – as evidenced by the prices at Wycombe, Luton, and the ever excellent Crewe Alex. It’s the Newport board who need to be answering questions here. SonLyme MyOldManSaid While they didn’t set the agenda, strictly speaking, the Villa marketing department were misleading in all those ticket office announcements on their website. The fact is, it also states ‘Newport County vs Aston Villa’ on the actual ticket. There were a few Villa fans, from what I’ve heard, who ended up at Newport, none to happy when the Under-21’s took to the field. If it was always an Under-21 game, this should have been made clear at point of sale. Since football clubs increasingly see supporters as consumers now, they at least owe them a duty of care under consumer law. The sounds coming out of Newport suggest they were expecting the likes of Bent, Ireland and Benteke. Their manager is even on record as saying, players with Premiership experience were confirmed to play by Villa. Also, I’ve heard that Villa’s general injury situation changed their approach to the game (which is their prerogative). Whatever – what about the supporters? Again, Newport are responsible for the overall scenario, but the main concern, regardless of club colours, is the fact that football supporters were exploited here, whether they were willingly or not. LeeMerrettMyOldManSaidSonLymeThe problem was, as the article shows, tickets were marketed as normal on the ticket office updates, which is sloppy and a mistake. So it’s like paying for ‘freshly squeezed juice’ but just getting a ‘juice drink’. Supporters deserve a duty of care as consumers. If this was in the retail world, you’d be able to take that product back.